Potter County is a county located in the U.S. state of Texas. As of the 2010 census, the population was 121,073. Its county seat is Amarillo. The county was created in 1876 and organized in 1887. It is named for Robert Potter, a politician, signer of the Texas Declaration of Independence and the Secretary of the Texas Navy. Potter County is included in the Amarillo, TX Metropolitan Statistical Area. The LX Ranch was established in the county by W.H. "Deacon" Bates and David T. Beals by 1877. In July of 1876, Bates, along with some cowboys that included Charlie Siringo, established a herd of steers and ranch headquarters along Ranch Creek on the north bank of the Canadian River. The headquarters eventually included a bunkhouse, kitchen, storeroom, stables, corrals, blacksmith shop, wagon sheds, and a post office named Wheeler. The LX also established the county's first cemetery. The ranch eventually extended from Dumas to the Palo Duro Canyon and 35 miles east to west. By 1884, the ranch encompassed 187,000 acres, 45,000 cattle and 1000 horses, when the operation was sold to the American Pastoral Company. In 1902, the ranch headquarters was moved to Bonita Creek, on the south bank of the Canadian River. On 6 Oct. 1910, that company sold 30,354 acres south of the river to Lee Bivins, and on 1 June 1911, R.B. "Ben" Masterson acquired 89,139 acres on the north side. On 19 May 1915, Bivins bought an additional 53,329 LX acres, which included the LX brand. According to the U.S. Census Bureau, the county has a total area of 922 square miles (2,390 km2), of which 908 square miles (2,350 km2) is land and 14 square miles (36 km2) (1.5%) is water. As of the census of 2000, there were 113,546 people, 40,760 households, and 27,472 families residing in the county. The population density was 125 people per square mile (48/km²). There were 44,598 housing units at an average density of 49 per square mile (19/km²). The racial makeup of the county was 68.60% White, 9.96% Black or African American, 0.87% Native American, 2.49% Asian, 0.04% Pacific Islander, 15.44% from other races, and 2.60% from two or more races. 28.11% of the population were Hispanic or Latino of any race. There were 40,760 households out of which 34.70% had children under the age of 18 living with them, 47.40% were married couples living together, 15.00% had a female householder with no husband present, and 32.60% were non-families. 27.60% of all households were made up of individuals and 10.10% had someone living alone who was 65 years of age or older. The average household size was 2.61 and the average family size was 3.21. In the county, the population was spread out with 28.00% under the age of 18, 11.10% from 18 to 24, 30.10% from 25 to 44, 19.10% from 45 to 64, and 11.70% who were 65 years of age or older. The median age was 32 years. For every 100 females there were 100.90 males. For every 100 females age 18 and over, there were 100.20 males. The median income for a household in the county was $29,492, and the median income for a family was $35,321. Males had a median income of $26,123 versus $20,275 for females. The per capita income for the county was $14,947. About 15.20% of families and 19.20% of the population were below the poverty line, including 25.30% of those under age 18 and 12.30% of those age 65 or over. 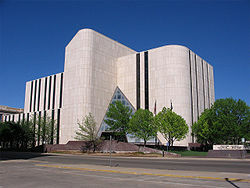 The Texas Department of Criminal Justice Clements Unit and Neal Unit are located in unincorporated Potter County, east of the City of Amarillo. Potter County strongly supports Republican candidates, especially at the federal level. It has supported Republican presidential candidates in every election since 1968, usually by lopsided margins. In 2004, George W. Bush received 21,401 votes (74% of the total) in the county to just 7,489 votes (25%) for his opponent, John Kerry. In 2008, John McCain fared nearly as well, garnering 20,741 votes (69% of the total) to 8,932 votes (30%) for Barack Obama. ^ Archer, Jeanne; Taras, Stephanie (2009). Touching Lives: The Lasting Legacy of the Bivins Family. Tell Studios Inc. pp. 45–57. ISBN 9780974914862. ^ Pingenot, Ben (1989). Siringo. College Station: Texas A&M University Press. pp. 3–13, 56–58, 121. ISBN 0890963819. ^ Siringo, Charles (1885). A Texas Cowboy, Or, Fifteen Years on the Hurricane Deck of a Spanish Pony. Pantianos Classics. pp. 75, 84–86, 96, 101–103, 107, 120, 128. ISBN 9781540575937. ^ Siringo, Charles (1912). A Cowboy Detective. Arcadia Press. pp. 98–00. ISBN 9781545001882. ^ "Clements (BC)." Texas Department of Criminal Justice. Retrieved on June 23, 2013. "Unit Address and Phone Number: 9601 Spur 591, Amarillo, TX 79107-9606"
Historic Potter County materials, hosted by the Portal to Texas History. This page was last edited on 3 February 2019, at 21:52 (UTC).